An inspired second half performance capped off an unbeaten season for Bangor University Women’s Football as they destroyed Aberystwyth 5-0. When the whistle was blown for the end of the first half, the mood was a little dejected around the Bangor University Stadium. Despite some good attacking play, and a large share of the possession, Bangor’s Women hadn’t managed to make it count and get themselves on the scoresheet. Ten minutes into the second half and striker, Ellie Alderson, gave the home side the lead. Less than four minutes later some great play down the wing from Anna Jones led to a cross into the box which was volleyed into the back of the net for Alderson’s brace. From then on it was all Bangor, with a flurry of attacks and despite a good first half from Aberystwyth’s goalkeeper, there was little she could do to keep her team in the game. Mari Gibbard’s 30 yard shot dipped over the keeper’s head for Bangor’s third of the match just 17 minutes into the second half. Only minutes later, Gibbard was picked out perfectly in the box but headed just over. In the 21st minute Alderson got her well deserved hat trick followed three minutes later by Jennifer Irwin making it 5-0 after another great cross from Jones. 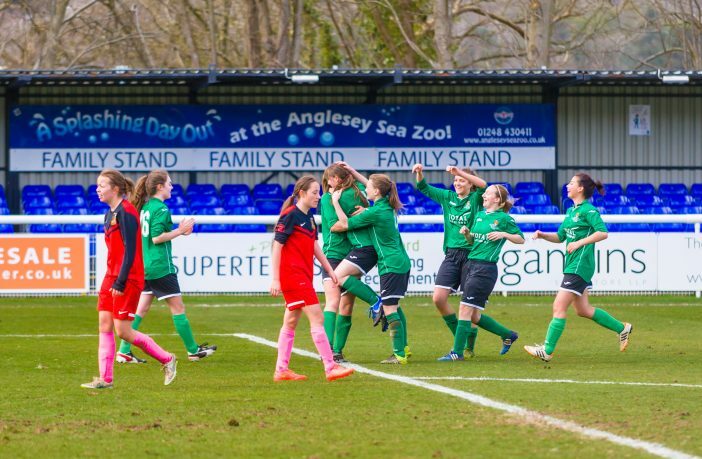 The home team kept up the pressure for the remainder of the match with Aber’s forwards only managing to put Bangor keeper, Ceri Pritchard, to work a small number of times towards the end of the game – all attacks that she calmly put to a stop. It was a brilliant win, and end to the season, for the team who topped their league, Northern 3A, without recording a single loss. “A lot of hard work put in by the girls – undefeated in the league and won Varsity for the second year running, you can’t ask for much more” said proud captain, Sally-Anne Wright after the match. “It’s my last Varsity, so it had to be done didn’t it? You just have to get the win for the last one, and I couldn’t ask anything more of the girls and it’s actually amazing. To actually captain and get them to two time Varsity champions it’s a great feeling” she said, to a chorus of cheers from her team.